in order to provide more effective service to others. School of Self provides professionally facilitated trainings and groups to support individuals and teams who operate in connection-based fields. We offer School of Self 101 and Advanced School of Self trainings. Coaches, Clergy, Educators, Executive Directors, Managers etc . . The process, EMOTIONALLY SAFE COMMUNITY BUILDING™, is based on the idea that community starts with self. This concept/process, coined by Discovery Horse, has been the catalyst to their community-based approach and its success. Emotionally Safe Communities offer a place where trust is built, mistakes are opportunities, compassion is cherished, courage is cultivated, and connection is sacred. When weather permits these groups will be conducted in the arena with equine support. BUT: These groups are about you. Not about horses. If you don’t care for them or don’t know them . . please don’t worry. Your level of comfort/like/dislike of horses will have very little bearing on the efficacy of this group. Connection. It is what drives and sustains us in our lives; personally and professionally. 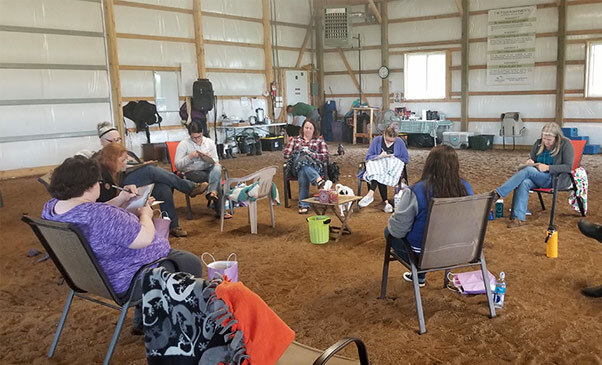 Working in a helping field provides us many chances to connect with others who we can serve, but how many of us are having regular and meaningful connection to those who can support and sustain us from within the field? School of Self at Discovery Horse provides the place and the skills to create that necessary and needed connection within our workplaces and within the culture of helping professions. The benefits of building these connections are innumerable and have the power to create lasting, sustainable relationships to combat burnout and high turnover rates. Take the time to invest in yourself, your staff/peers, and the power of connection that Sara and her team create. You won’t regret a moment. Sara makes an art out of exploring connection. 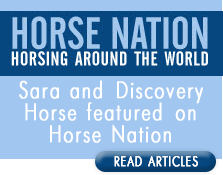 Discovery horse provides a powerful opportunity to examine one’s own genuineness in personal and professional life. I liked that we didn’t focus on our roles in our professional life, but had a chance to identify who we are as individual. Holding space for one another in a safe environment was opportunity for all to examine the relationship with self. I have felt a shift in my being that will benefit my personal and professional growth. Customize a School of Self experience for your team, group or organization! Our 2 day, retreat style event is our public offering within the School of Self program. We offer these retreats periodically throughout the year . . with and without horses. We also offer customized training and groups to fit the needs of YOUR community agency, team or organization. Remember . . . the primary focus of SOS is to deepen the relationship we have with self . . .so that we may better the relationships we have with others and more effectively use the tools of our trade. We do provide tools and offer resources of course, but the truth is, most people come to us with more than enough training. What is often missing is the access individuals have to that training, especially when under pressure.